The Single Exercise Eight Forms and Paired Exercise Eight Forms are designed to develop combat techniques. In the past, masters of various styles of the Eight Diagrams Palm often take in the most powerful and effective movements from each other in order to improve their techniques. But the movements of the two routines passed on by different masters are a little due to their different understanding and combat experience. 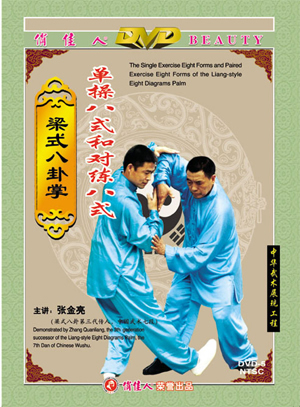 The single exercise eight forms of Liang-style Eight Diagrams Palm passed on by Li Zi-ming has two kinds. One is introduced here. The forms are named as the the Raise and Strike with Forward Step, the Brush and Strike with Forward Step, the Close and Bump with Forward Step, the Chop Whirlwind Palms, the Turn Hand and Tuck Palm, the Deflect Downward and Strike Upward, the Deflect Hand and Thrust Ribs, the Spring on Face with Yinyang Palms. The Paired Exercise Eight Forms are named as the Hips-Pulling-in Palm, the Double Closing Palms, the Double Deflecting Palms, the Twisting Hand Palm, the Opposite Raising Palms, the Double Tearing Palms, the Loosening Wrist Palms, the Tri-Piercing Palms.